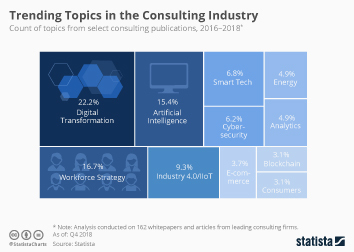 The consulting industry provides professional advice in a variety of specialized fields, including management, IT, human resources, environmental regulations and real estate, among many others. In 2017, the global consulting market was forecasted at around 262 billion U.S. dollars. The management consultant sector, which generally advises organizations on how to improve their performance, had an expected market size of 139 billion U.S. dollars in the same year. According to consultants employed by reputable firms, the most prestigious consulting firm in the United States in 2017 was McKinsey & Company. The New York City-based management consulting company received a score of 9.03 out of ten for prestige. Other consulting firms in the top ten prestigious companies included the “Big Four” accountancy and auditing firms Deloitte, PricewaterhouseCoopers, EY (Ernst & Young) and KPMG. Deloitte placed the highest out of the four. Headquartered in New York, Deloitte is a professional services company specializing in auditing, tax, consulting, enterprise risk and financial advisory. In 2017, the company’s revenue reached approximately 38.9 billion U.S. dollars – over a third of which came from consulting. The third best-rated consulting firm to work for in the United States in 2017 was Bain & Company. Based in Boston, Massachusetts, Bain & Company is considered one of the leading three management consulting firms together with McKinsey & Company and The Boston Consulting Group. More interesting topics from the industry "Consulting"